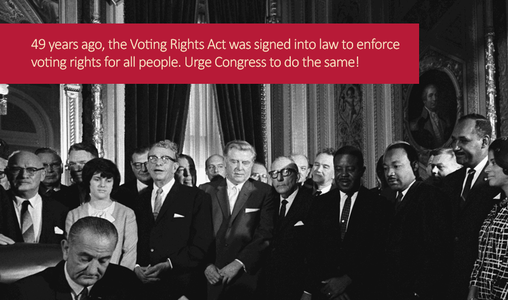 WASHINGTON – Forty-nine years ago today, President Lyndon B. Johnson signed the Voting Rights Act of 1965 and that has been a cornerstone of the civil rights movement, by ensuring that every American citizen, regardless of race or language, has equal access to the vote. But about a year ago, the U.S. Supreme Court gutted the Voting Rights Act. In addition, the Leadership Conference on Civil and Human Rights warns that states and localities around the country are making changes to elections that would take away the right to vote for some people based solely on the color of their skin or the language they speak. Since 2010, 22 states have passed laws restricting the right to vote. You can help. Click here to sign a petition to your Senate and House members urging them to move forward with the Voting Rights Amendment Act. Every day Congress fails to live up to its constitutional obligation to protect the right to vote, it gives a free pass to voting discrimination. The above article appeared on the AFL-CIO Now blog today. Photo: Forty-nine years ago today President Lyndon B. Johnson signed the Voting Rights Act into law.